We have been practicing this for generations. From the forages and manure applications that were done in the 1800’s to the cover crops and no-till we are using today, we have always been good stewards of our land. Sustainability is an important part of our vision at Barlow Farms. Just like our ancestors did in the 1800’s, we are treating the earth and the land that we cultivate with the utmost care. The old saying goes “if you treat your soils right, they will reward you”. That saying couldn’t be closer to the truth. The soil is the most important part of our vision, and treating it right is key to our success and also to future generations. Being stewards of the land comes with its challenges. We want to grow the best crops possible and also do so in a sustainable way. 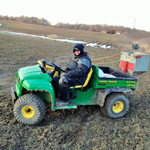 To overcome those challenges we have several sustainable soil initiatives at Barlow Farms. One initiative we took over 20 years ago was to follow a conservation tillage regime to reduce the amount of primary tillage (plowing) that we do to our fields. Primary tillage is done once every 4 years or one full crop rotation. The other 3 years are almost entirely no-till where conventional tillage is rarely used and old crop residues remain on the soil surface. By leaving the old plant tissue on the surface we help with soil moisture retention, crusting due to heavy rains, and most importantly this is the primary food supply of earthworms and soil bacteria. Another element is the application of Ag Lime (just limestone screenings from a local gravel pit) to keep the pH balance of the soil close to neutral. This allows for optimum plant health through better utilization of minerals and nutrients in the soil. A low pH (acidic) soil requires more fertilizer than a neutral soil. 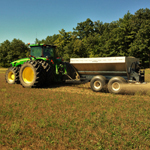 The third part of our soil conservation initiative is the seeding of a cover crop after our winter wheat is harvested. This means that new plants are still actively growing in that soil and the roots are interacting with the soil instead of just having old tissue and dead roots. We have found that red clover is an excellent fit into our rotation and does a great job of loosening up the soil but also helps by taking up some key nutrients which are then given back to the following years crops. 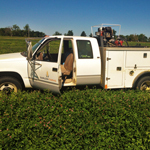 Sustainability is not something that we take for granted at Barlow Farms.